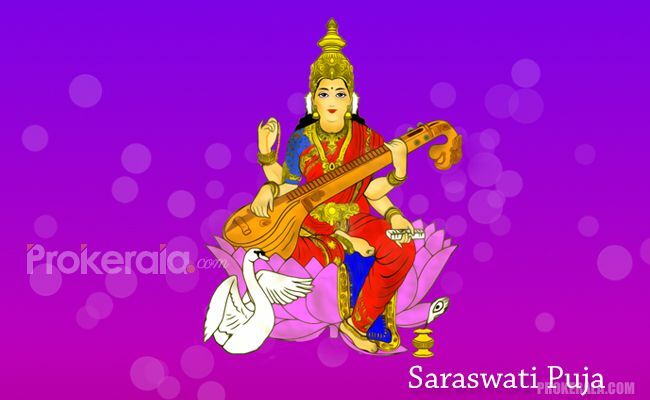 Saraswati Puja is an important festival, especially in South India. Here it is observed on the last day of the Navratri celebrations and is celebrated on the same day as Ayudha Puja. The 10th day or ‘Dussera’ is also included in the celebrations of Saraswati Puja. In the states of Tamil Nadu and Kerala, Saraswati Puja is celebrated on the 9th day (last day of Navratri) whereas in Karnataka and Andhra Pradesh it is observed on the 10th day (Dussera). However in the western and northern parts of India, Goddess Saraswati is worshipped for 4 days during the auspicious Navaratri period. The puja begins with ‘Saraswati Avahan’, followed by ‘Saraswati Puja’, on 3rd day ‘Saraswati Balidan’ is done and the ceremonies end with ‘Saraswati Visarjan’. On the occasion of South Saraswati Puja, devotees worship Devi Saraswati, the Hindu Goddess of Knowledge and Wisdom. In Southern India, on the following day of Saraswati Puja, children aged between 4-5 years, begin their ‘Vidyarambham’ ceremony. South Saraswati Puja is among the most grandly celebrated and revered festivals. The festivities can be witnessed in all nooks and corners of the southern end of India. During the South Saraswati Puja, as a part of the Navratri celebrations there is a tradition of displaying ‘Kolu’ in households. Kolu refers to showcasing and displaying miniature forms of Gods, Goddesses, animals, birds, spiritual personalities and art work to name a few. People, who do not display a Kolu, use an idol or picture of Goddess Saraswati to perform the puja. Have you seen: Beautiful Pics of Durga Puja Celebrations 2018? On all the days of Navratri Puja, devotees perform special puja of the Kolu and make several offerings. As white color is known to be the preferred color of Goddess Saraswati, most of the offerings are made in this color. A garland made from white flowers is offered to Goddess Saraswati. During the South Saraswati Puja, use of white lily is considered to be very auspicious. It is believed that offering white lily bestows generous blessings of Goddess Saraswati. On the day of South Saraswati Puja, children also offer note books and stationery items to the Goddess. It is believed that children, who are weak in studies, should chant hymns or shlokas dedicated to Goddess Saraswati on this day. The festival of South Saraswati Puja is dedicated to Devi Saraswati, the Goddess of knowledge, wisdom, arts and education. According to the Hindu legends, Goddess Saraswati is a part of the trinity Goddess and on the last day of Navratri is manifested as ‘Maha Saraswati’. The ninth day is also called as ‘Maha Navami’. Know More:The Fine Art of Mastering Dandiya Raas and Garba Dance. As per the mythological stories, it was on this day that Goddess Saraswati created powerful weapons to kill the demon named ‘Magishasuran’. The weapons were then considered to be Holy and people began to worship them. This tradition is followed till date and began to be celebrated as ‘Ayudha Puja’. On this chosen day, people worship their tools and weapons, used in day-to-day life. During the Navratri celebrations in South India, the first 8 days are dedicated to varied forms of Goddess Shakti and last day is devoted completely to Goddess Saraswati.